Last week, I was invited to join a special invitation-only media luncheon hosted by Natural Foods Chef, Fitness & Sports Consultant and Healthy Living Advocate, Pooja Mottl. I was intrigued to check this out for many reasons - a). I often seek to find ways to incorporate healthy and wholesome foods into my diet b). I was highly intrigued about the prospect of a personalized lunch served in an amazing venue, The Architects & Design Building and c). I was looking forward to meeting my fellow media counterparts - bloggers, writers, and other creatives. The luncheon was held in honor of Pooja's newly-launched website, poojasway.com, which is a great resource for well-rounded healthy living - including tips and commentary about food, exercise, as well as mental and physical health. I found it especially useful from a female perspective, showing you that busy urban women, faced with many daily tasks throughout the day can incorporate health into their repertoire. Overall, I was impressed by Pooja's knowledge and her approachable demeanor. 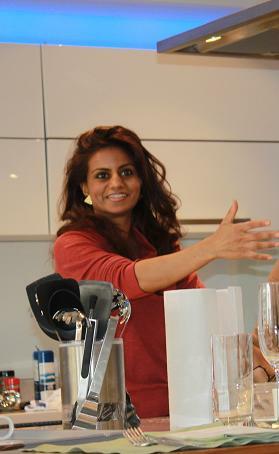 The luncheon allowed for food demos and a Q&A with Pooja, which definitely left me with valuable take-aways. Here's a bit more about the food and the lovely surroundings in which this event was held. Held at the Miele Manhattan Gallery in the Architects and Design building, the venue for this lunch was elegant, contemporary and provided the most amazing view of Manhattan. Besides the beautiful stainless steel kitchen appliances that conjured up a real-life image of a dream kitchen, the dining area was equally impressive. Two medium-sized communal tables, set with gorgeous sage place settings and colorful flowers further communicated the elegance and the quality of the meal we were about to enjoy. I liked that the dining room tables provided us with a prime view of the kitchen, which was airy and accessible. Pooja was busy working away in this area, and it was cool to see that it was her (along with a small team) that prepared our lunch, thus giving this event and Pooja herself much deserved credibility. The lovely lunch we were treated to was so enjoyable - not only because it tasted good, but it left me feeling good. Too often after eating a large lunch, filled with creamy foods, I feel unsettled or uncomfortable for the rest of the day. I was excited that Pooja's food was gentle on the belly and didn't weigh me down. 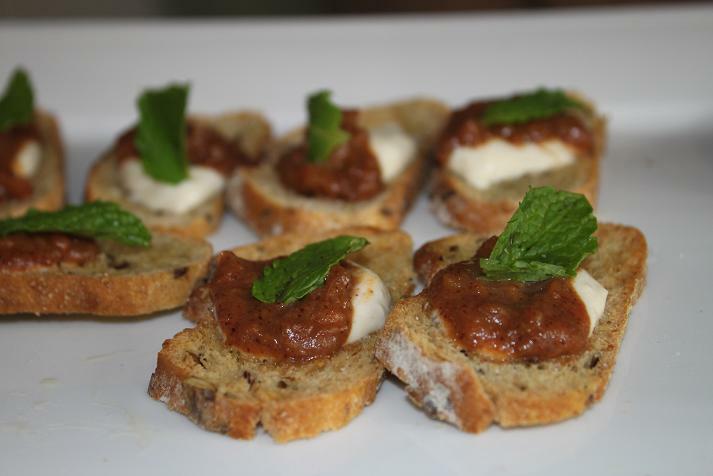 Toasts with Tamarind Date Chutney - This elegant starter looked amazing and packed a punch in flavor, with ethnic notes from the tamarind and a cooling dairy-free raita that's often used in Indian cuisine. I loved that the little toasts were crunchy but still not so toothsome that they hurt your gums. The juxtaposition in flavor between the chutney and the raita (strong vs. cool and mild) was a wonderful way to wake the palate. 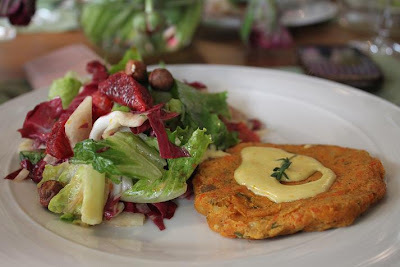 Wild Salmon Patties and Jicama/Basil Salad - The main course consisted of sauteed wild salmon dill patties that also included a tofu binder and a citrus aioli on top. Even though I was really rooting for this dish, I just didn't care for it at all. The dill was overpowering and I wasn't in love with the fish itself. I took a few bites and then continued to eat just the side salad, which was simply amazing. Made of crunchy jicama (aka Mexican potato), peppery radicchio, fragrant basil, beautiful dark blood oranges and a simple oil/citrus vinaigrette, the salad was refreshing, sophisticated and super healthy. I loved the contrast in flavors and textures - from bitter to sweet and from soft to crunchy. 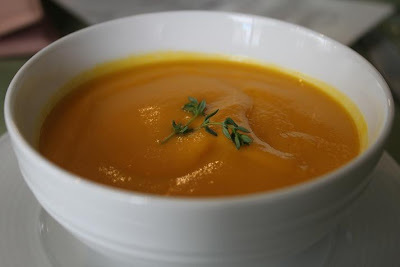 The latter component came from a modest sprinkling of toasted, whole hazelnuts, which added a delicious, earthy element. Vanilla Cake with Hazelnut Cocoa - Once again an au-naturale dish (not dairy free since it's made with butter), it was still fair on the tummy. 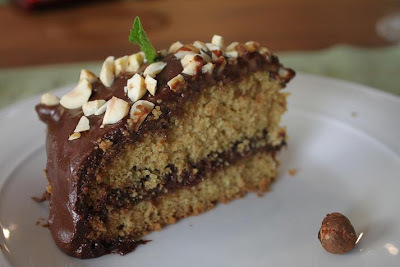 The cake itself was moist, airy and interestingly paired with a thick hazelnut cocoa cashew frosting. It tasted like Nutella but slightly more chocolatey and less thick. The crunchy hazelnuts (not cashews) on top added something special in terms of taste and texture. I swore to myself that I wouldn't finish this generous piece, but it was so good that in the end, I couldn't keep that promise. Great seeing you, Judith. I'm so glad we were able to sit together and catch up! Looking forward to seeing you again soon. Have a great day.